This Thai salad recipe comes with the tangy, delicious Thai salad dressing recipe below! It's spicy and a little hot but you can adjust for your taste. These are available as two of our printable low glycemic index recipes. It's a perfect side dish for a Thai meal or if you add the tuna it will make a complete dinner or lunch. A little dried shrimp added to the dressing gives it even more flavor. You can find dried shrimp at Asian markets or in a natural foods store. It keeps for a very long time in the refrigerator. Assemble all your ingredients for the salad and the salad dressing below. Start your recipe with the salad dressing. Add all of the ingredients to a container with a lid. Shake until well mixed. Add water if the dressing is too strong, adjust to taste and shake well again. Put the green apple "sticks" (below) in a small bowl, cover with the dressing and stir thoroughly. Let the apple marinate while you put together the salad. Toss all the ingredients together. Then add the apples to the rest of the salad and toss again. This dressing is quite spicy and a little on the hot side so you may want to start with a teaspoon of chili sauce and add more if you like the heat. * If you can't find this sauce in a market you can make it yourself with a jalapeño pepper chopped fine and then mashed until it makes a paste. This makes enough salad dressing for one salad. 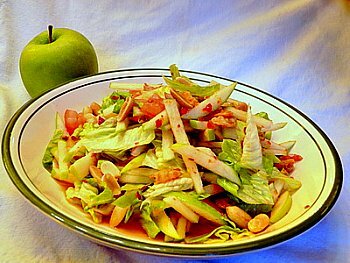 This Thai salad recipe and dressing are popular dishes in Thailand. It's an easy salad to make and spicy enough to add some spark to a side grain dish or served with meat and vegetables. There are excellent reasons to include Asian cuisine in our weight loss plans. Asian style cooking in general leads to very little body fat and very low risk of heart disease. It contains no dairy products and only small portions of meat in a meal. Even though they eat lots of rice it is served with protein and lots of vegetables which reduces the glycemic index. It's not industrially refined rice either which also diminishes the glycemic effect. Traditional Asian rice is an unrefined grain that contains essential nutrients. You can buy traditional Asian rice in an Asian or Thai market. One rice product I've seen in a Thai market is a mix of white rice with whole grain rice which is perfect for flavor and nutrients. Asian cuisine includes many omega 3 foods, nuts, seeds and fish which burn fat. The Thai salad recipe above has peanuts and is great with fish. There are highly beneficial effects of diets that are 2/3 vegetables and fruits. American diets tend to be too high in red meat consumption which is linked to a variety of health conditions including heart disease and cancer. You could eat brown rice or other whole grain rices other than white sticky rice on a low glycemic plan as long as you eat lots of vegetables and little meat with your meals. Thai cooking is so flavorful and perfect for low glycemic eating. I love this Thai salad recipe. It's so spicy you probably won't be tempted to over eat! This salad goes especially well with stir fry fish or chicken and vegetables. Return from Thai Salad Recipe to Lifetime Fat Loss home page. Return from Thai Salad Recipe to Low Glycemic Recipes.